Last night I was sitting at the computer trying to think about what to write for IBOT this week. I had nothing. So I asked Dave what he thought I should write about. The ABC 4 Kids changes he said with a smirk. That was his answer to the same question last week, which I did of course do. I said that maybe he should write a post for me, the blogging ladies love a guest post from the men. He looked at me like I was from Mars. "Well how about I interview you, would you do that?" Do I have to be serious, he asked? When I said no he was all on board. So here it is. I typed Dave's answers as he said them. The italics are direct speech from his mouth. Everything else is what I observed or said to him. It's disconcerting how quick he answered some of these and not others! What is the best part about being married to Kylie? Dave: What? Put me on the spot. Do I have to answer honestly? Ummmmm, she breast feeds our kids so I don't have to wake up in the middle of the night. What is the worst part about being married to Kylie? Dave: Taste. *shoves a spoonful of pumpkin cous cous in my mouth* It's one of my special ingredients. Worst part? Ummmm. The time I wake her up is not the time she actually wakes up. Having to deal with her absolutely and utterly not being a morning person. Say something like that. What is Kylie's most annoying habit? When asked to elaborate... That sums it up. Sookiness. Especially in the morning. What is Kylie's most endearing habit? Dave: I don't know. Insult ones are easier, coz they are the ones I notice. Surely there is something, I ask him. Ok, now this is starting to get a little weird. Is there anything at all I ask? Dave: What about, she's not as sooky in the evenings. He laughs. That's not a habit I tell him. Dave: People will think we have a heaps sweet marriage *statement drips in sarcasm*. What do you admire most about Kylie? Dave: Your ability to hold a conversation with strangers and acquaintances. What was the first thing that attracted you to Kylie? What was your favourite thing to do with Kylie pre-kids? Dave: Have bonfires down the back of Mum & Dad's. Fishing. What do you miss doing with Kylie now you have kids and limited time? Dave: It's a tie between folding clothes and mowing. Dave: Probably a tie between cooking and doing the dishwasher. Dave: That peanut chicken noodle thing we had the other day. What do you think annoys Kylie most about you? Dave: When I say "What about me? ", or when I whistle, or when I give you undie snaps, though I know you secretly love undie snaps. What do you think Kylie loves most about you? Kylie: No. I really don't! Why do you think Kylie is lucky to be married to you? Dave: Coz I cook. I don't wanna say the normal smug, coz I'm handsome or anything, but that is one of the reasons. And coz I let you sleep-in in the morning. Dave: Patience. And biting your tongue every now and then. You could say choosing my battles. And affection and all that business. And the other business. If you know what I mean. You could write bow chicka wow wow. Have you ever interviewed your husband or partner for you blog? Are you game enough? I'm inviting everyone to interview their partner on their blog and come back and let me know so I can check it out. I think it would be interesting to get a partner's insight into my blogging buddies! And tell me, what do you think is the secret to a happy marriage? Love it but I might need you to explain what undie snaps are? Photos of undies or something else? Not sure I'm game to interview hubby, especially with his mother about to arrive for an extended visit but never say never. Sounds like both of you have a great sense of humour which is essential for this marriage thing. I'd love to interview my Micky Blue Eyes but not sure if he'll go for it. Hmmm...we'll see. My husband would not do this!!! This is so close to what Dadabs would say its scary! Separated at birth perhaps? Love this Kylie it really is great to read another side to you perhaps. You obviously are great friends I that is the secret. I'm game to try this with my man I think the conversation might be similar. Oh that is too funny. I might have to steal these questions and ask my husband the same. Funny you asked this, because I interviewed my husband almost a year ago and asked him about his GC Kokoda Challenge and he's about to do it again next weekend! I'll have to see if I can find the interview. I think you're man is onto something about the secret to a happy marriage. Patience. Biting your tongue. Bow chicka wow wow. I think that about sums it up! Hahaha thats sooo Dave. And my dear, you could hold a conversation with a shoe. A wise man your Dave. Sounds like a keeper! Haha I love this. I've actually considered interviewing my husband a few times,p. I should do it! Love it! Seriously what is with the undie snapping? Paul does it too and thinks he's hilarious! Great post!! Renee from Mummy Wife Me sent me over for the linkup! Love this! What a neat idea. And a man that can cook - awesome! 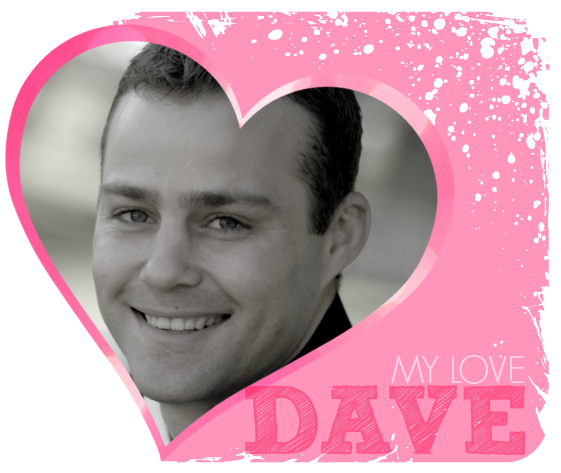 What a sweetie Dave sounds... except for the undie snaps. That would drive me nuts!